Here is the first of a series of reviews from some of the hottest restaurants in Sydney at the moment. I hope you enjoy reading them as much as I enjoyed eating at them. Cheers. Sepia Restaurant is one of the most exciting restaurants to dine at in Sydney right now. It was borne as a collaboration between British-born Chef Martin Benn, formerly the Head Chef at Tetsuya’s, and Sydney seafood king George Costi of De Costi Seafoods. Benn began his cooking career at the Oak Room in London, after which he moved to The Landmark, and later to the Criterion where he cooked under Marco Pierre White. He located to Australia in 1996 and spent some time at Sydney’s Forty One Restaurant before moving to Tetsuya’s in 1999. 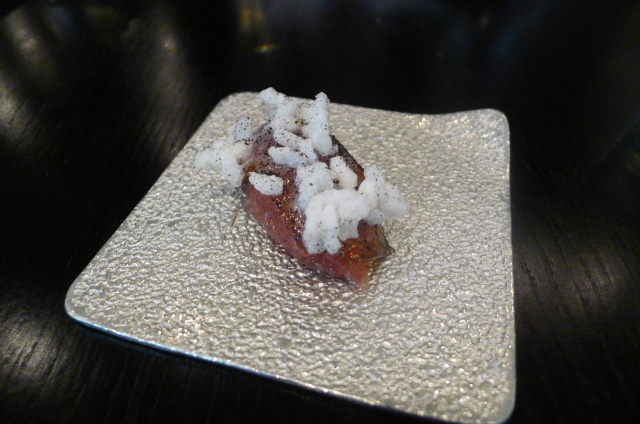 It was at Tetsuya’s where he honed the contemporary/Japanese fusion approach to cooking for which Sepia is known. As far as restaurants in Sydney goes, Tetsuya’s is legendary, and in 2012 it ranked 76 on San Pellegrino’s World’s Best Restaurants list. 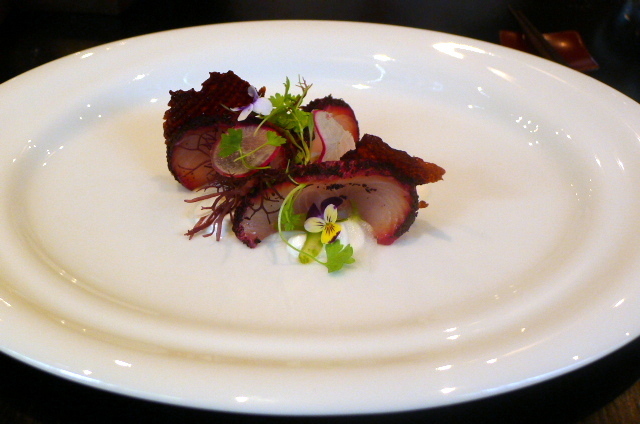 A Head Chef position at Tetsuya was therefore no mean feat, especially as Benn achieved it at the ripe young age of 25. Sepia winning the SMH Good Food Guide’s 2012 Restaurant of the Year, as well as ‘Three Hats’, the highest possible ranking within the SMH’s restaurant rating system. We elected to go for the eight-course tasting menu for $160 (about £103) which kicked off with an amuse bouche of tuna nigiri with wasabi, soy and puffed rice. The tuna, cut into small pieces and shaped into a nigiri, was beautiful and melted in the mouth. The wasabi and soy worked well with the fish, and the puff rice added a crunchy texture. 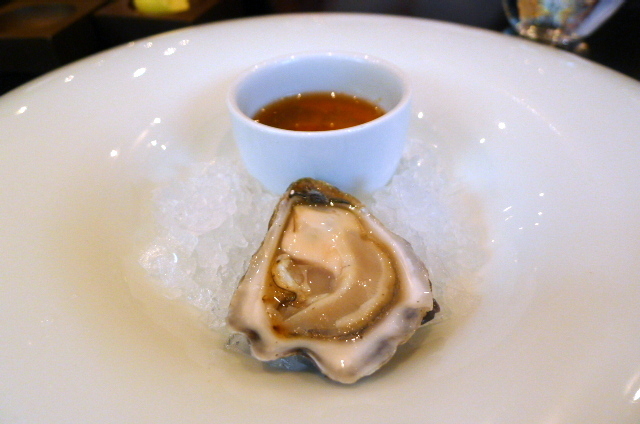 Tetsuya’s is famous for its signature rock oyster with a vinaigrette of rice vinegar and ginger. Sepia has something similar with a vinaigrette of lime and rice vinegar (at a $5 supplement, about £3.20). Sepia’s rock oyster was good, but the vinaigrette didn’t quite have the zingy and refreshing refinement of the Tetsuya’s version. Kampachi yellowtail came with a sheep’s yoghurt for dipping, tonburi seeds, celery, heirloom carrots, pickled aka seaweed and some spiced crispy duck skin that was particularly delightful for its super crunchiness. It was a wonderful combination of fresh ingredients, but on the whole this dish tasted a little dull. with pickled ginger, avocado cream and puffed sushi rice, with the rice completing the sushi effect. The scallops were beautifully cooked and had been rolled in nori powder for an added toasty sea flavour. This dish was divine, and the loveliness of the scallop was further accentuated by the acidity of the ginger and the delicate flavour of the avocado. 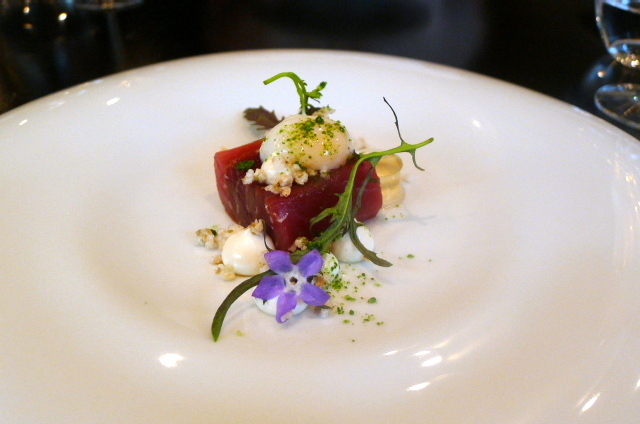 Next was the sashimi of Yellow Fin tuna which had been matched with Jamon Iberico, poached quail egg, white soy jelly, dashi onion cream, Tasmanian wasabi, puffed buckwheat and red elk. A well executed dish, the eclectic and considered combination of ingredients provided many layers of unami flavours. Particularly fantastic was the inspired and tasty dashi onion cream. A dish of butter poached Port Lincoln squid was stunning. The flesh was tender and there was a lovely butter flavour coming through it. Barley miso, cured egg yolk and hints of lemon rind and aromatic sorrel rounded off this satisfying dish. 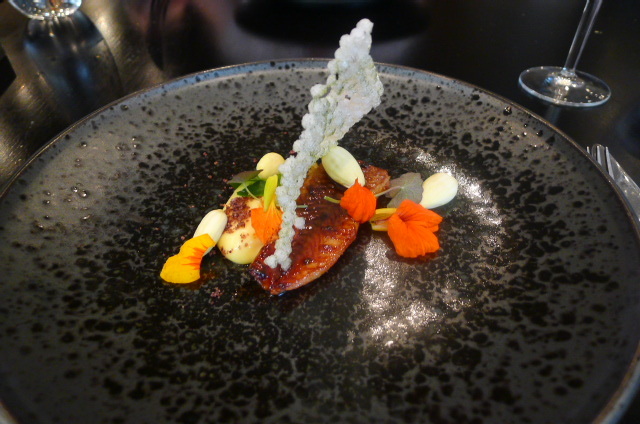 Charcoal smoked freshwater eel was rich and robust with flavour. The accompanying yuzu curd was a fantastic match for the eel, although there was just a touch too much of it on the plate. 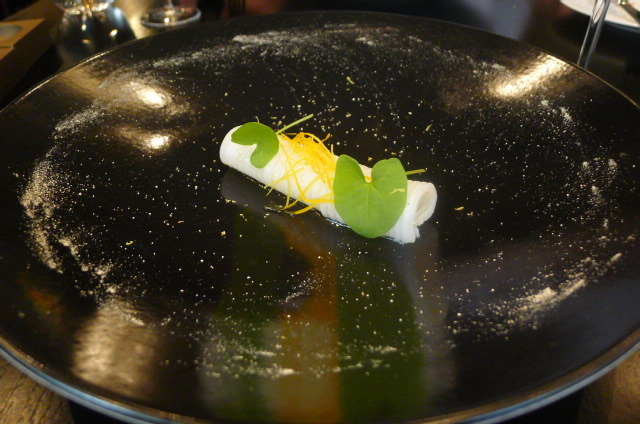 There was a subtle use of licorice in the dish that was very well judged. 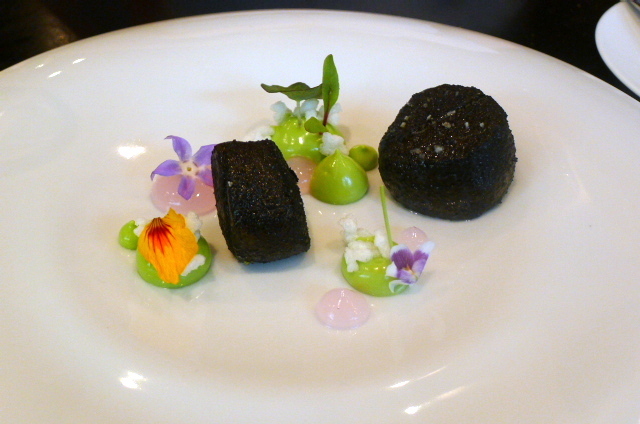 Tapioca and green almonds added texture and the use of watercress and nasturtium added bite. This was a really lovely dish. 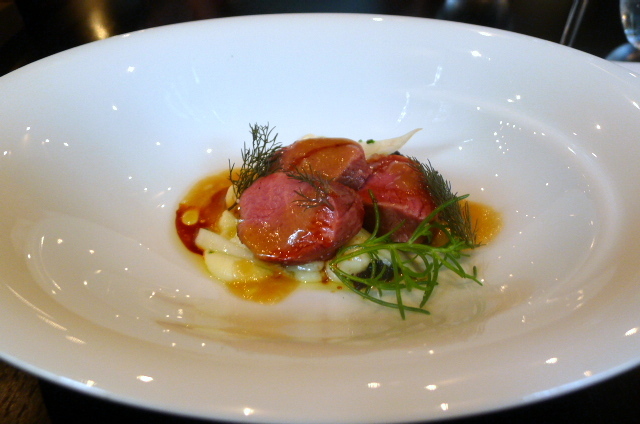 South Australian lamb was of a wonderful, tender quality, and the accomplished goat’s cheese and sake kuzu dumpings, and the sprinkling of Japanese land seaweed worked well with the lamb. A black olive miso vinaigrette provided seasoning, and a fennel molasses gave the dish a gentle sweetness. Seared David Blackmore Wagyu sirloin beef was tasty, but I would have preferred it cooked as a thick piece of beef rather than the way in which it had been flattened and then rolled. In that way it would have tasted meatier and been more medium rare. Beautifully cooked ameko mushrooms, Barletta onions, red onion juice, some interesting Tasmanian wasabi fried potatos, crunchy kombu crumbs and citrus soy completed the dish. 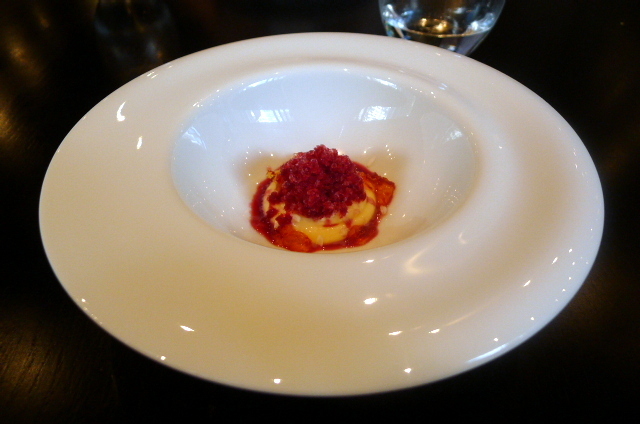 A pre-dessert of ginger and white chocolate mousse with carrot and hibiscus was paired with shiso and caramel jelly. Although it was a touch sharp from the strong use of ginger, it was delicious and satisfying nevertheless. 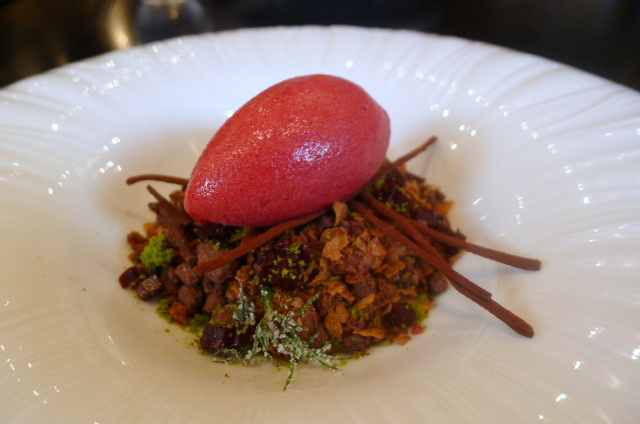 A “Spring chocolate forest”, consisting of a mixture of chocolate twigs, blackberry jellies and crystallised fennel fronds, was superbly done. Creamy textures of soft chocolate, a hazelnut and almond praline and a divinely tasty rose geranium cream formed the base. On the top was a dollop of sour cherry sorbet and its sharp tangy flavour merged beautifully with the richness of the chocolates. Finally, hints of green tea and licorice completed this exotic experience. 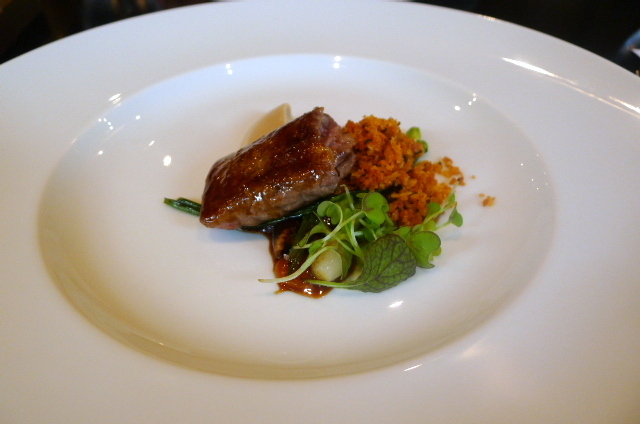 In a European location, Sepia would easily be a one-Michelin starred restaurant. So technically flawless was the execution of this meal, it was hard to fault it in anyway. The intelligently conceived menu was inspired, and there was a carefully managed juxtaposition of ingredients and flavours that allowed each dish to achieve balance and harmony as well as purpose. It was skillful cooking at its very best. Sepia Restaurant sports a contemporary look that slots in well with its Sydney Central Business District location. Its slick and dark, and the staff communicate in hushed conservative tones. It may feel a little stuffy for some, but I thought the cooking well worth it. Note: Prices have been converted at exchange rates current at the time of this review.